Our own-developed mouse model of p53 conditional knockout (p53-CKO) can be mated with mice carrying tissue-specific Cre expression to obtain mice with homozygous deletion of p53 in specific tissues or cells. These mice can be used for tumorigenesis and tumor mechanistic studies. As a "celebrity" tumor suppressor gene, p53 can regulate cell cycle and prevents the onset of cell carcinogenesis. The p53 gene is called the "guardian of the genome" and is one of the tumor suppressor genes most frequently associated with mutations in human cancer. 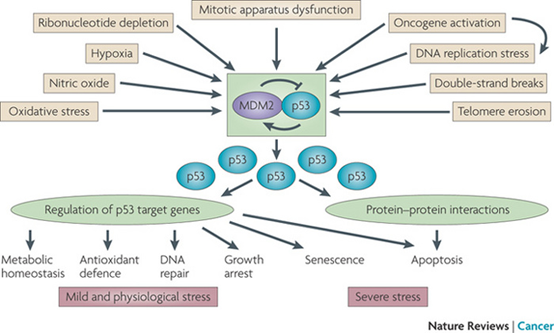 The p53 gene is mutated in 50% of cancer types, and the remaining cancer types are frequently looking for other ways to induce the inactivation of p53. The p53 gene is usually expressed at a low level in all types of cells. However, genetic damages (e.g., damages caused by ionizing radiation) induce the activation of p53 proteins. The p53 gene acts as a transcription factor to regulate the expression of p21, an inhibitor of the cyclin-dependent kinase involved in the regulation of cell cycles. Activation of p53 results in G1 arrest in the cell cycle, allowing cells to repair DNA damages before entering the S phase and initiating DNA replication. In other cells, the activation of p53 causes the activation of multiple effectors, thus leading to apoptosis - the DNA in such cells may have been irreparably damaged. Our own-developed mouse model of p53 conditional knockout（p53-CKO, enter the ordering page），can be mated with mice carrying tissue-specific Cre expression to obtain mice with homozygous deletion of p53 in specific tissues or cells, thus avoiding the death caused by tumors that are generated too early in homozygous mice with systemic p53 knockout. For example, after mating with MMTV-Cre mice, the p53-CKO mice can be used to study breast cancer. After mating with Cdh16-Cre mice, the p53-CKO mice can be used to study endometrial tumors.